It was early Saturday morning at Larbert station and the southbound platform was crowded with almost 500 soldiers waiting to board trains that would begin their long-awaited journey to the front. The sense of occasion on that day in 1915 was heightened by the presence of Camelon Pipe Band, who had assembled to give the officers and men of 1/7th (Leith) Battalion, the Royal Scots, a suitable send off. in the aftermath of the disaster on May 22nd 1915. The troops were bound for Gallipoli, where British Empire forces were fighting in what is now modern day Turkey. The sense of excitement at the station was palpable. After being encamped for several weeks at the nearby Tryst in Stenhousemuir, close to where Ochilview Park now stands, they were on the brink of serving their country at a time when patriotic fervour was all-consuming following the outbreak of war in August 1914. But 214 of the soldiers would be killed before crossing the border to England without ever facing the enemy or hearing a shot fired in anger. 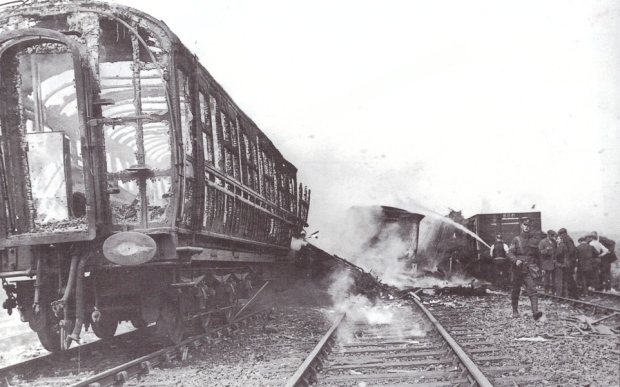 At 6.50 a.m. on May 22nd, 1915, one of the troop trains travelling from Larbert collided with a local passenger service that had been shunted on to the main line at Quintinshill junction, north of Gretna. An express train to Glasgow crashed into the wreckage a minute later. The gas lights fitted on the trains created a devastating fire storm. At least 226 people were killed in the carnage, although the exact figure is unknown due to severity of the blaze and the loss of all regimental records in the crash. The accident was later found to have been caused by reckless working practices on the part of two local signalmen, who were later jailed for culpable homicide. The 100th anniversary of the disaster was commemorated at the railway station where most of the victims began their fateful journey. Leading the procession will be Camelon Pipe Band, providing a direct link to the pipers who played at Larbert station on the morning of May 22 a century ago. The Camelon band was so moved by the tragedy that it joined the Royal Scots en masse to replace pipers killed at Quintinshill. The story of how the group signed up to replace the battalion’s lost band has been kept alive by descendents of those involved but has never been fully detailed - until now. It centres around the McLachlan family from Union Road, Camelon. Three brothers - Charles, Alexander and Dougall - were all taught to play the pipes by their father, Peter, and would serve in the Great War. Dougall was a member of Carron and District Pipe band before he founded the Camelon band in 1913. When the group enlisted in the Royal Scots, Dougall became the youngest pipe major in the British Army. It is highly likely he was among the pipers who was playing at Larbert station on that morning in 1915. A battalion diary published in 1920 by Lieutenant Colonel Peebles of the Royal Scots, and distributed among the victim’s families, contains the following entry from November 1918, 18 months after the tragedy. Although largely recruited from Edinburgh, the 1/7th Battalion had been warmly welcomed by communities in the Falkirk district, which explains why the Camelon band was present at Larbert to see them depart.